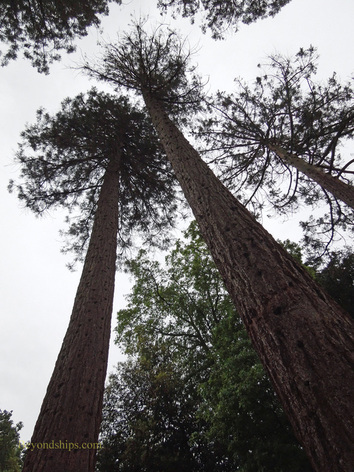 Above: The tallest tree on the property is in the American Garden. Below: The newest tree - - the Queen Mary 2 tree. Below: Down by the river where the D-Day invasion craft gathered. 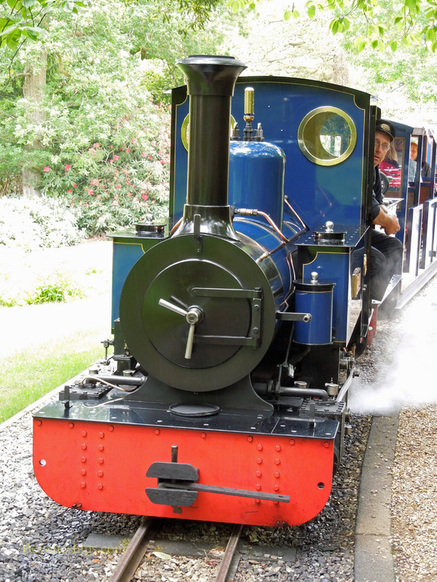 All too soon, our train came to a halt near the American Garden and we disembarked. Other visitors not with our group then continued on with the train. Our guide explained that this garden was so-named because of the collection of American rhododendron presented to Edmund de Rothschild (also Nathan's son) after the damaging Great Storm of 1987. In addition, the majority of the plants in this area were from North America. Most of the group was from America and so quite a few photos were taken. It is a strange facet of human nature that when one is traveling, things from home take on heightened interest. We were then guided along a path through a park-like section of the gardens. There on a gentle slope overlooking a pond, we found a little tree that our guide told us was our tree - - We were to do an official tree-planting to mark our visit on the occasion of Her Majesty's Diamond Jubilee. This news came as something of a surprise but the group was obviously pleased. All of the hard work had already been done. The tree was already in the ground. Thus, all each visitor had to do was transfer a spade full of earth from the pile next to the tree onto the area surrounding the trunk of the tree. 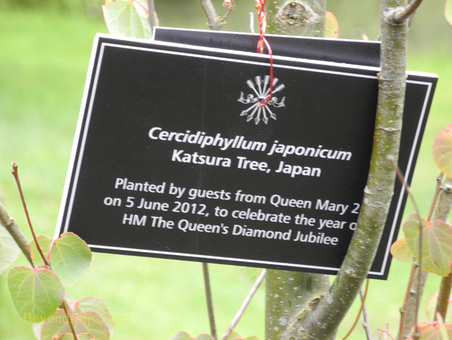 The Gardens had already placed a sign on the tree stating what type of tree it was and explaining that it had been planted by guests from the Queen Mary 2 during the Diamond Jubilee. 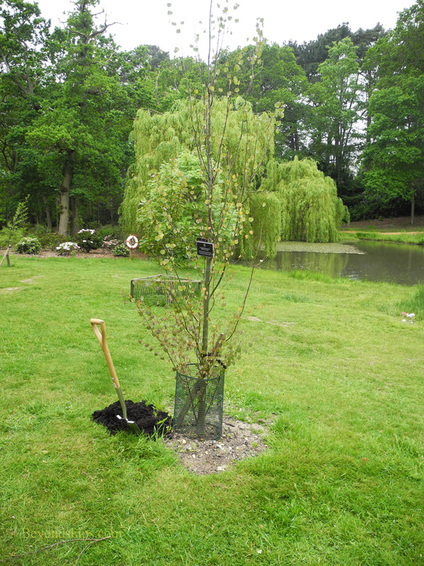 It was nice to think that future visitors would read the sign and enjoy the tree as it grew. This was the end of the organized part of our visit. We now had two hours to explore the remainder of the gardens on our own. The guide, however, made suggestions as to the most interesting route to take. By now, the sky was no longer threatening - - it was actively raining. Some members of the group decided to continue on using umbrellas and raincoats. Others decided to head back and wait out the storm in the Gardens' tea shop. But there was another alternative. 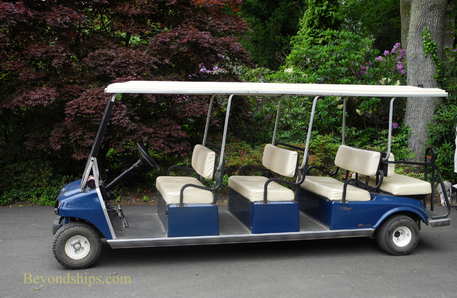 The Gardens have several vehicles called “Buggies” that look like a stretched golf cart and for a few pounds they take people on guided tours of the gardens. They are open on the sides but have a roof and a windshield and so offer protection from the rain. Since it was uncertain whether the rain would ever stop, I choose this alternative. Although I like to walk, I think this would have been a good choice even if it had not been raining. 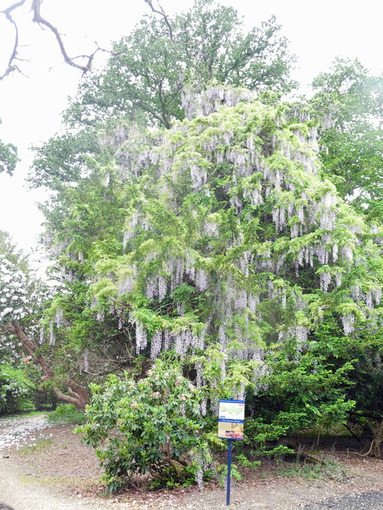 The driver/guide was able to explain the different sections of the gardens and point out unusual plants. He was also quite accommodating. If one of the passengers expressed an interest in something he would take us to see it and pointed out related things along the way. We traveled through glades, past stands of tall Sequoias, brooks and ponds with flowering plants and numerous rhododendron. It was enchanting. 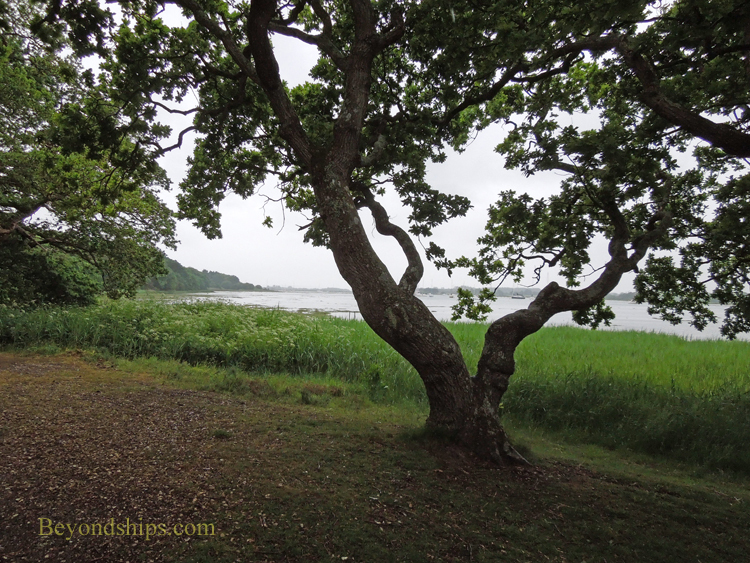 One of the places we went was along the Beaulieu River. Here, the guide pointed out, landing craft and assorted ships for the D-Day invasion were marshaled before setting out for France. Since the day of our visit was the fifth of June, this was an especially poignant moment. 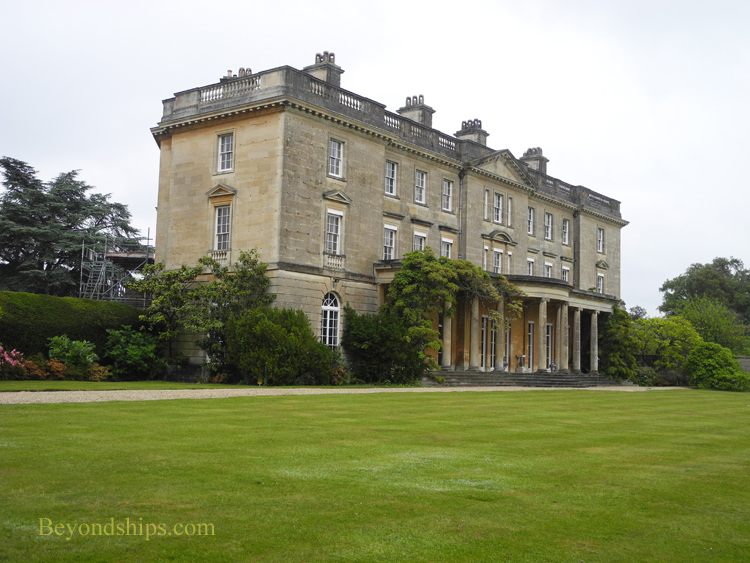 Exbury House was also used during World War II. It was requisitioned by the Royal Navy and given the name HMS Mastodon. Amongst other things, the house was used in D-Day planning. 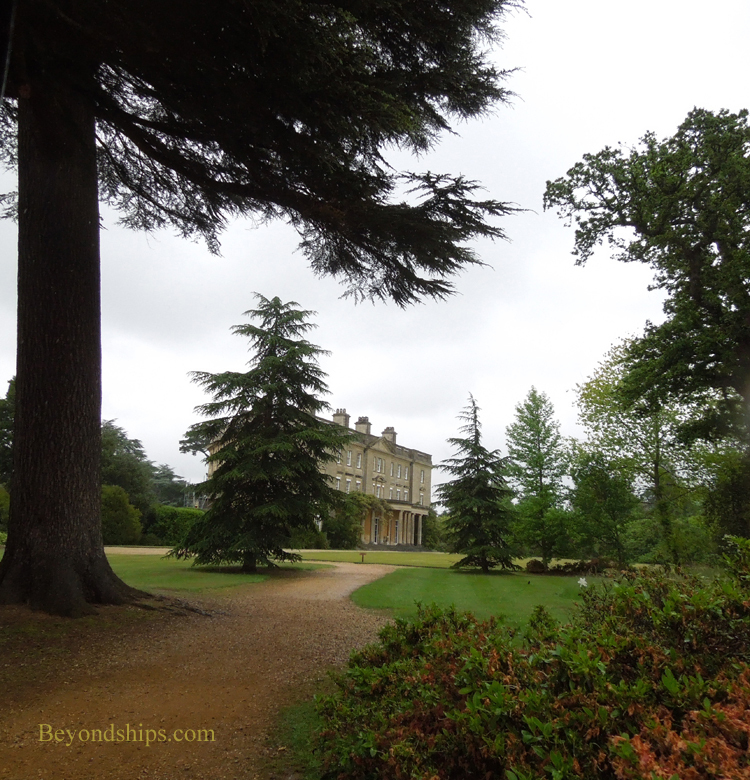 Author Neville Shute was posted here and used Exbury as the setting for one of his novels. The house is not open to the public. It is still used by members of the Rothschild family. However, you can look at the exterior of this stately home with its manicured lawns. After about an hour, the buggy brought us back to the entrance to the Gardens. Even in the rain, they had been beautiful and one could well imagine that they must be magnificent in the sunshine.